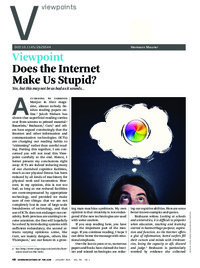 ﻿ Beats Biblionetz - Texte: Does the Internet Make Us Stupid? Es ist nicht schlimm, wenn wir durch digitale Technologie dümmer werden, solange wir bei einem Ausfall der Technologie noch überlebensfähig sind und wir unsere Kreativität nicht verlieren. According to Farhood Manjoo in Slate magazine, almost nobody finishes reading papers online. 5 Jakob Nielsen has shown that superficial reading carries over from screens to printed material.a Bauerlein,1 Brabazon,2 Carr,4 and others have argued convincingly that the Internet and other information and communication technologies (ICTs) are changing our reading habits to “skimming” rather than careful reading. Putting this together, I am concerned you will not read this Viewpoint carefully to the end. Hence, I better present my conclusions right away: ICTs are indeed reducing many of our cherished cognitive facilities, much as our physical fitness has been reduced by all kinds of machinery for physical work and locomotion. However, in my opinion, this is not too bad, as long as our reduced facilities are overcompensated by appropriate technology, and provided we make sure of two things: that we are not completely lost in case of large-scale breakdowns of technology, and that use of ICTs does not endanger our creativity. Both provisos are starting to receive attention: the first will hopefully be solved by introducing systems with sufficient redundancy; the second attracts varying opinions: some, like Carr, see mainly dangers, others like Thompson, see our future in a growing man-machine symbiosis. My own opinion is that creativity is not endangered if the new technologies are used with some caution. If you stop reading here, you have read the important part of the message. If you continue reading, I hope I can drive home the message with emotional emphasis.